Homa and Mukto are great friends with very different perceptions of life. It’s these differences that keep their work fresh and alive. Inspired by the visionary mystic Osho, their workshops are a synthesis of therapy and a direct experience of the present moment. Having met Osho over three decades ago their lives underwent radical change and it soon became clear they had a passion and gift for working with people. Over the years they’ve received training from many world class therapists and meditation teachers in a variety of approaches. From 2006 to 2015 they led tantra groups in the OSHO resort in Puna, India. Currently they share their work in South America, Europe, the Middle East and Asia. 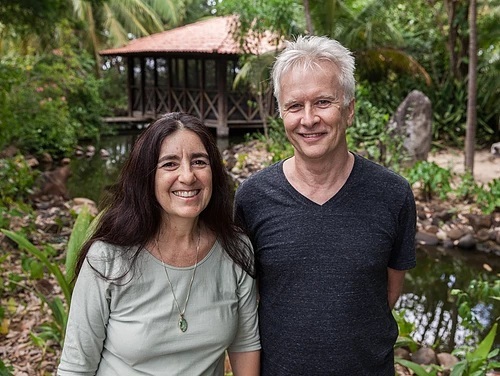 For the rest of the year they live in Fortaleza, Brazil at Osheanic International, the venue of their yearly Tantra Trainings.